Shown below are free ads available in Property for sale, Halifax. You will find classifieds for sale and to buy. Please click a classified ad below for more details or to reply to it. You can use search box above to find other items for sale or services offerings in category Property for sale in Halifax or look in the Halifax neighborhood. FARM/HORSE PROPERTY IN NOVA SCOTIA (HANTS COUNTY). Active Tourist Complex , 28 Room Motel.10 Cottages, full hookup Campground, 76 seat Licienced Restaurant, located in high traffic tourist area. Presently open 5 months a year great year round potential.Located in New Brunswick near Hopewell Cape Rocks, minutes from Fundy National Park and city of Moncton . 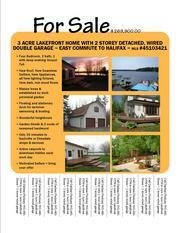 Amazing lakefront property located on McGrath Lake, live at the lake and work in Halifax. Beautiful landscaped acreage lot to the water with floating dock. Great opportunity for family fun, enjoy a year round retreat. This 2 storey home boasts open concept layout with wood vaulted ceilings & cozy woodstove, and is decorated in warm neutral colors. The front of the house has space for two cars. There is a large veranda at the front with a bench. This is great for getting out of wet clothes before entering the house. The house has a hallway that runs through to the back door. There are coat hooks here and space to store wet shoes. We think that the small alcove to the left as you go in the front door was originally where the bar was. This home was uniquely built for the convenience of young professionals, or retired couples. Open concept with the most amazing kitchen with Corian counter tops and new appliances. The double sided fireplace serves a purpose for both formal dining or the great room. The master bedroom has double closets and an ensuite that is like a showroom. Check out this 3 bedroom 1.5 story on the Peninsula and priced to sell! This home features good sized living room with hardwood floors and big windows for lots of natural sunlight. Large eat-in Kitchen has exposed brick wall and backdoor leading to covered veranda which overlooks an oversized backyard. MLS 40294613 $1, 189, 000 Classic Georgian style ocean front estate. Deep sheltered water frontage with wharf, floating dock & mooring. Family home with gracious rooms, self contained in-law suite. Exclusive ocean front living with a short commute to Halifax core. Additional Property Details. Nice bright semi-detached in Eastern Passage upgrades include new vinyl windows on front, four year old shingles, hot water tank, and updated paint. The main floor features hardwood, a spacious kitchen, open concept living room, formal dining room with patio doors leading to a private deck. The upstairs has three bedrooms and a four piece bathroom. "Luxurious" says the Observer "Affordable" says the Times "Carefree" say all of our buyers This is a pre-sale price for this 1700 sq. ft. 3 bedroom, with den. This building site puts you in the best seat in the house; in row one at The Anchorage. This house will be built with the same care and attention to detail that The Anchorage is known for. Unique in NS, this incredible 100% custom home has an easy luxury & entertaining style unlike any other in Metro. Architecturally designed with many details being one – off custom pieces, this home will satisfy even the most discerning buyer, allowing for a comfortable lifestyle like no other. Amazing soaring vaulted ceilings & incredible catwalks, custom-milled solid cherry pillars, one-off curved door cabinetry, and a bar that puts most of downtown Halifax to shame are some of the unique elements that set this property apart. P.E.I. Hotel, Price reduced, 58 rooms + dining & conference, owner retiring, call Lloyd Parker, Millennium Commercial Realty 902-483-8881. Looking for your dream house or potential B&B? Look no further than this gorgeous 6 bedroom home in the pristine and tranquil community of North Riverside, Guysborough County. Located just 15 minutes from amenities in Guysborough, this home offers an amazing kitchen with granite countertops, stainless steel appliances and hardwood floors. Excellent Home in Lost Creek Subdivison. Ready for immediate occupancy! MLS 40869737 Listed with Exit Realty Professionals www.foywishart.ca. Over 3 acres of pure, natural beauty! View this magnificant home in Prospect in one of the most picturesque subdivisions in the HRM, just 20 min to Bayers Lake. This is the best lot in the subdivision offering plenty of space and over 185` feet of direct ocean access on Shad Bay. This home was custom built by and is owned by a local developer. Phase II of this sought after development, consists of acre plus lots, all deeded ocean access & access to Fox Point Lake. Lot 45, 46, 47 & 48 have direct lake frontage. Experience the best of both worlds, with a short 1/2hr commute to Halifax and Bridgewater or a short scenic drive to many quaint seaside and rural communities as Hubbards, Chester and Mahone Bay. Wow! This really is a Dream Home! Don`t miss your opportunity to own this fully furnished home in this Unique Community of Voyageur Lakes. Surrounded by nature and the peace and privacy of your own large landscaped lot on the duck pond. This stunning professionally designed and decorated home has everything. #2484 A brand new 2 bedroom split entry home. This home is unfinished on the inside so the new owner can go in, take measurements and finish to their liking. There is a full unfinished basement done in ICF forms (insulated concrete foam), which prevents heat loss. This is a raised split level home with a great view of the LaHave River. Nestled among the trees, this private contemporary cape house is located on desirable Corkums Island (which is connected to the mainland by a causeway) only minutes from historic Lunenburg. Consisting of 1.78 acres, in an established neighborhood of upscale homes on a quiet lane, expansive ocean views are yours to enjoy forever. Amazing curb appeal in this 2 storey home on quiet crescent backed on a greenbelt in Eastern Passages newest development. This quality built home is only one year old and built beyond building code standards for enhanced peace of mind. Its large foyer leads into an open concept kitchen with large family room complete with propane fireplace, formal living room, dining room and full bath complete this level. CRICHTON PARK SIDE SPLIT, showing so well. Exterior expertly landscaped with private deck, interlocking brick walkways, new 16x12 storage shed, even a gate to the school yard! Inside light & bright with new (+ additional) windows, fireplace re-faced, updated kitchen with custom cabinery, both baths have been totally renovated- lovely! As well, there are hardwood floors throughout and you will be `moved` by the grand entrance/foyer! Colours are up to the moment, decor tastefu1 and housekeeping superb. This home is larger than it appears. It Features three bedrooms on the upper level, and two bedrooms and a rec room on the basement level. These features make this two-storey a great family home in a great neighbourhood! The large master bedroom features an ensuite and two other good size bedrooms on the second level. Lot 3 Half Moon Cove Rd. A nature lover's retreat with 2.3 acres of treed privacy and +/- 477 feet of direct saltwater frontage on Half Moon Cove. The property would lend itself to boardwalks, there is room for a wharf, a babbling brook runs through it and the bowl shaped elevation allows one the option to site the house with wide ocean views. Stunning Home in the Ravines of Bedford South! Amazing stunning home in sought after Ravines in Bedford South. This home is only four years old with original owner. The well appointed entrance leads for an open concept kitchen and family room combined with a propane fireplace. This level also features a formal living room and dining room, powder room and extra large closets in the garage entrance foyer. Custom built mini home on one of Sackville Estates nicest lots, oak country kitchen, formal livingroom, separate laundry room, 3 bedrooms, fenced lotwith a 10x10 private patio with gazebo, completley mainenance free exterior. Just move in. Price includes all appliances and blinds. Listing Agent: Stephen. This unique home is a sweet deal for the right person. It has a new kitchen, cherry wood floors, carpet in bedrooms, tile, bath, deck and roof, all in the last 2 - 3 years. The home has been rented and in the owners absence, a bad paint job on the exterior has not been finished and the grounds have not been well maintained. 3 Bedroom bungalow on quiet street backing on greenbelt of Bisset lake. Ideal family home close to schools, finished basement with Family room, games room and 4 pc.bath and walkout to back yard. Upgrades include hardwood floors on main level, new vinyl windows and kitchen countertop. Save dollars with the 2 Electric Thermal Units. This 13 yr old 2 bedroom, 1 bath home sits on 2.44 acres with a four stall barn, paddocks and a sand riding ring. Home has two spacious bedrooms, large bathroom, and an open concept living/dining/kitchen. Finished family room downstairs with wood stove. Barn has electrical and water, tackroom and storage area. Great opportunity! High traffic area! High visibility! Excellent investment opportunity. NOTE ` Seller is related to one of the listing realtors` Listing Agent: Darren Nauss. Perfectly positioned on 2.9 acres to take full advantage of the La Have River and its beautiful sunset, Dovetail Cottage is a custom designed home, solidly built in the TCF construction method. The light and airy living space of the main level boast vaulted ceilings, ash beams, stone fireplace, in-floor heating, ash kitchen cabinets and large windows overlooking the La Have River. Canada free classified ads for Property for sale, Halifax, Property for sale free ads Halifax, Property for sale for sale Halifax, Property for sale to buy in Halifax. This page is a search result of classified ads for Property for sale category in Halifax. This listing includes classifieds for sale and to buy in Halifax. If you posted an ad on Property for sale, Halifax before please use Edit my ads button to change or cancel your advertisement. Property for sale Halifax ads Halifax, Property for sale classifieds Halifax, Property for sale free ads Halifax, ads for sale Halifax, ads to buy Halifax, FREEADS in Canada. Find here ads for sale, to buy and rent in Halifax. Goods for sale in Halifax, vehicles for sale in Halifax, Halifax real estate for sale, Halifax property for sale, property for rent in Halifax, business ads in Halifax, Halifax business classifieds, services in Halifax, Halifax services ads, jobs in Halifax, pets for sale in Halifax, Halifax dating, Halifax cars for sale.